Although engineered hardwood often comes pre-finished, it is still a good idea to seal it. Installing hardwood flooring is a great way to add to the value of your home. Many homeowners choose engineered hardwood flooring because it can be a bit more cost effective than solid hardwood. Although engineered hardwood often comes pre-finished, it is still a good idea to seal it. Sealing adds an extra layer of protection to your flooring, and can also help it last longer. Here are some more benefits of sealing your engineered hardwood flooring. All hardwood flooring is vulnerable to water damage, but engineered hardwood can be more vulnerable than solid hardwood if it isn’t properly sealed. When hardwood is damaged by water or some other moisture, the damage can go below the surface. This can lead to many costly repairs. If the damage isn’t caught in time, moisture damage can necessitate a full replacement of your flooring. Making sure your engineered hardwood flooring is properly sealed can save you time and money. Many homeowners choose to install hardwood flooring because of its warmth and classic, natural beauty. Unfortunately, time takes its toll on everything and your engineered hardwood will eventually wear down. Sealing helps to prolong the life of your flooring, so that you can enjoy the many benefits of your hardwood for as long as possible. 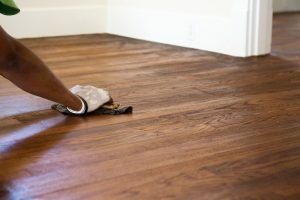 Because of the way it is manufactured, it isn’t typically possible to refinish engineered hardwood. Even if it is possible, engineered flooring can only be sanded down so many times before the top layer is gone and a new floor is needed. Since very little material is needed to ensure your floor is well-sealed, it is a cost-effective way to protect your flooring investment. This entry was posted on Friday, December 15th, 2017 at 12:46 pm. Both comments and pings are currently closed.